Check out some of our favourite recipes below. If you have one of your own please share it with us! Rinse the chicken and pat it dry. Drizzle olive oil over the chicken and sprinkle the bird generously with coarse salt and pepper. Place the chicken into a clay baker or baking dish, adding 1/2 cup stock or white wine to the bottom of the pan. Turn oven to 275 degrees Fahrenheit and roast the chicken, covered, for about three hours. Increase the heat to 375 degrees Fahrenheit and continue roasting for about thirty to forty-five minutes. Remove from the oven and allow the bird to rest five to ten minutes before carving and serving. 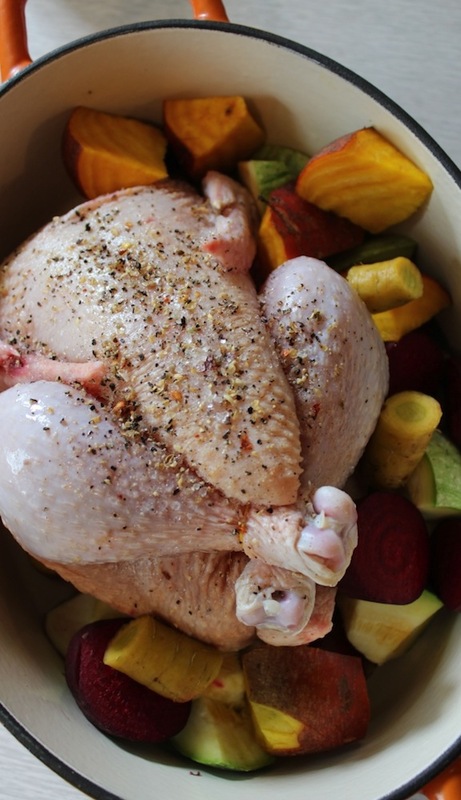 **Save the chicken’s frame to make roast chicken stock. I love this recipe. The first time I used this recipe I decided to bake the filling in a casserole dish (no crust) and serve with fresh cheese biscuits. It was a bit of a time saver and very delicious. Combine the flour, salt, pepper, and dried herbs in a medium bowl. Use a pastry blender or fork to cut the butter or lard into the flour mixture until it is crumbly. Add the ice water gradually, mixing quickly with a fork until the dough it just moist enough to hold together. Be careful not to add too much water. You may not need the full 6 tablespoons. Shape the dough into a ball, then place on a floured surface and roll out to a rectangle at least 9X13 inches. Melt the 2 tablespoons of butter in a large saucepan, then saute celery, carrots and onions over medium-high heat until they are crisp-tender, approximately 4 to 5 minutes. Remove to a large bowl, and keep warm. Add the salt, pepper, corn, peas, and shredded chicken or turkey to the vegetables, and stir gently until well combined. Melt the remaining 4 tablespoons of butter in a saucepan. Turn off the head, add the flour, and stir quickly. The mixture will be pasty. Over medium heat, stir in the broth, milk, half-and-half, and thyme. Bring the liquid to a boil, stirring occasionally; lower the heat and simmer, stirring often, until the sauce is thick and rich. Stir in the sherry. Pour the sauce over the meat and vegetables, and mix gently. Season to taste with additional salt and pepper. Pour the entire contents of the bowl into a 13X9 inch baking pan, and top with the herbed pie crust. Fold down and crimp overlapping edges so that the crust fits inside the pan. Pierce the top several times with a sharp knife, and bake for 25 to 45 minutes, or until the top is golden brown and the filling is bubbling. This recipe is simple and delicious! 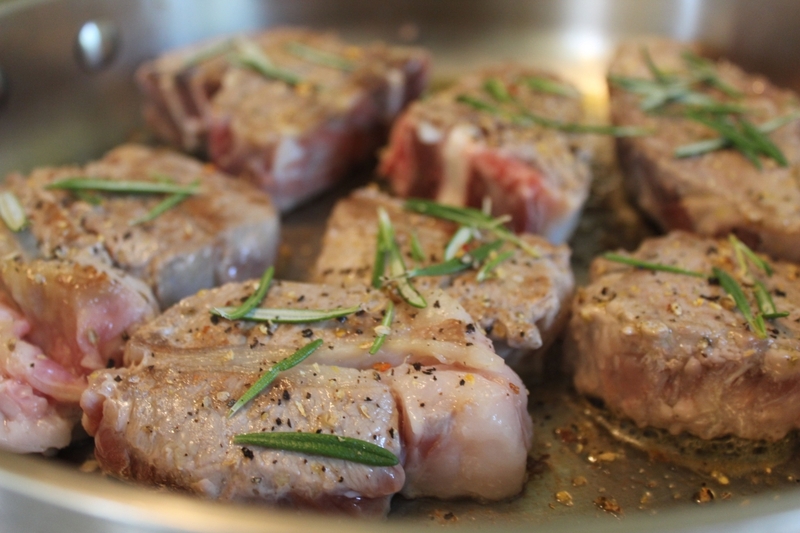 This is one of our favorite ways to cook lamb chops. We regularly use coarse salt when cooking meat. It really does make a difference. Pierce the lamb chops on both sides with a sharp paring knife, and insert 4 to 5 garlic slivers into each side of the chops. Brush the chops on both sides with olive oil, then turn them on their sides and brush each side as well (the fat on the chops will crisp up and will taste awesome)! Sprinkle all sides of each chop, including the fat, with salt pepper and rosemary. Set the broiler on high, and broil for 5 minutes on each side for medium-rare chops. Rub the Rosemary, Thyme and Mustard Paste all over the leg, and rest the lamb at room temperature for 1 to 2 hours. Place the leg of lamb in a large roasting pan, set it in the oven, and immediately lower the heat to 250F; continue roasting until a thermometer reads 120F for a rare roast, 130F for a medium roast, or 140 for well-done. Cooking times will vary based on the size of the leg and desired doneness, but allow at least 2.5 hours at 250F for a medium rare 5.5 lb roast. 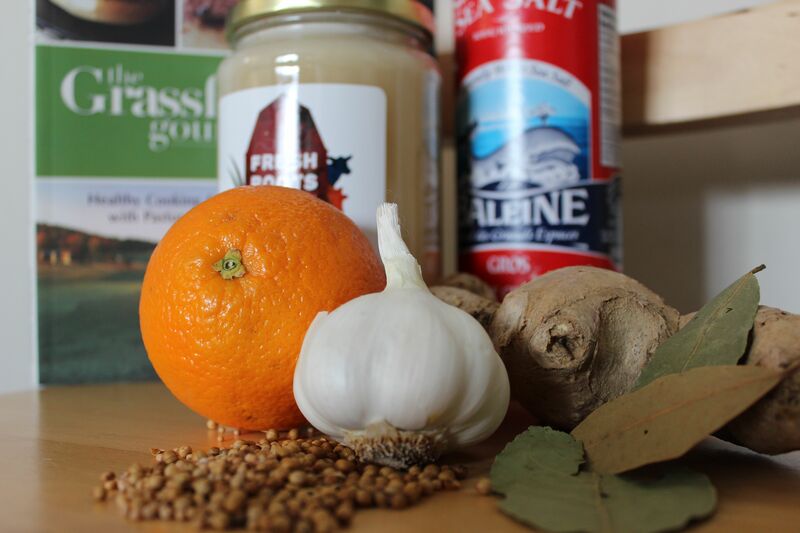 We have used this brine for both pork roasts and chicken! The following cooking intruction are for pork but if you would like to do this with chicken simply soak in the brine for 24-48 hours and then follow the Easy Roast Chicken recipe above. 1 4-6/lb pork roast (loin, shoulder or ham)! Stir the salt and honey into 8 cups of hot/boiling water. Make sure your container is large enough to hold your submerged roast. Add the remaining ingredients except for roast. Let cool to room temperature. Submerge roast. Cover and refrigerate. Let sit for 24 hrs or 2-7 days for more flavour! You can place the roast in the brine frozen or thawed. Remove the meat from the brine and wipe dry. Roast for 15 minutes, then lower the temperature to 300F. Roast until the internal temperature of the meat is 145F to 155F. Remove the roast from the oven, and tent is loosely with foil. Allow the meat to rest for 10 minutes before serving. The internal temperature should rise another 5-10F. The meat will be very tender, juicy and flavourful. You could make gravy out of the pan scrapings. If you are preparing a bone-in roast save the bones for stock! Enough can not be said for the wonderful taste of dried fruit with pork! This simple Slow-Cooker recipe is great! Coat the pork with the Mustard Sage Rub. Cover with plastic wrap and refrigerate overnight, or allow them to sit for 2 hours at room temperature. Place the onion, leek and carrots in the bottom of a large slow-cooker. Set the shoulder (aka blade) chops on top, then cover with the prunes and apricots. Pour in the sherry, stock and brandy; add the bay leaves. Cook on low for 6-8 hour, until the meat falls from the bone. Place the ground beef in a mixing bowl. Whisk together the egg, oyster, Worchestershire sauce, minced onion, garlic powder, salt and pepper. Pour over the ground beef; add the bread crumbs. Using your hands, lightly mix all the ingredients togethers. 2. If you are grilling your burger cook on a clean grill, uncovered over med. heat 3 minutes per side. Note: Don’t press on burgers with your spatula while cooking as this squeezes out the juices.